My best friend Ann and I just took a fabulous BFF trip to Asheville, NC. I am still “glowing” from our fun time together when we were able to spend almost 5 days together catching up and enjoying the sights. I have quite a few posts that need to be written about the trip but all in good time. They will all keep, won’t they? I can pull those memories out over the next few months and share them with you because that will help keep the time alive. Of course whenever I go anywhere I manage to find a teapot and this trip was no different. I found a lot of teapots but only came home with one. This one was the one I decided to buy. 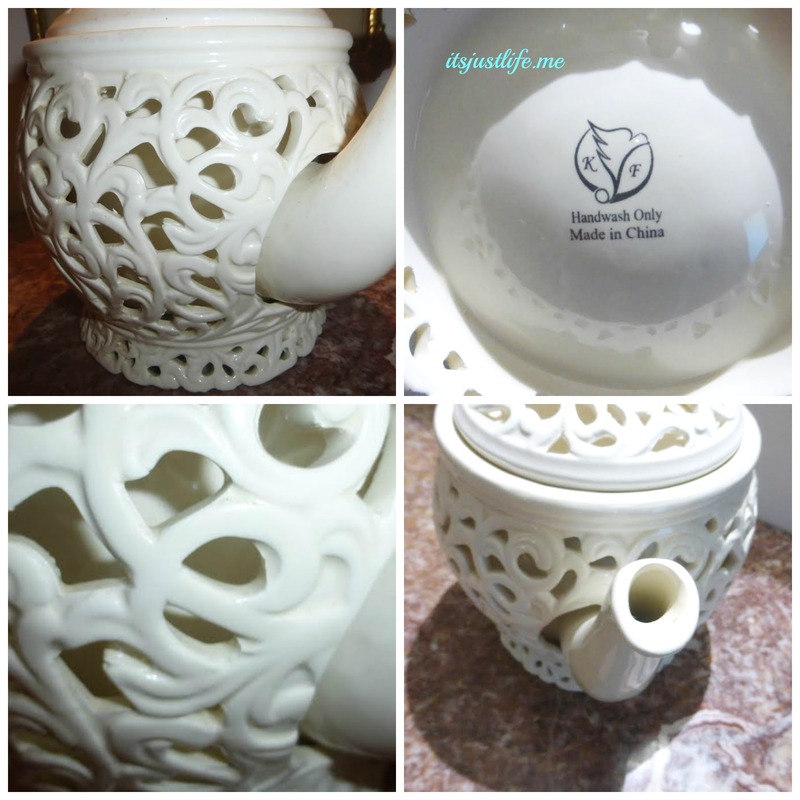 I loved the lacy look of this delicate but sturdy teapot. It is surprisingly heavy and even with a lacy pattern it definitely can hold a hefty pot of tea because the lace is an overlay of sorts. I think you can see how beautiful this teapot is. I saw so many teapots over the 5 days but this one was THE one that jumped out at me. Want to know where I found it? Keep reading. The first full day we spent in Asheville we decided to do a bit of exploring in the downtown area and Ann found The Downtown Market. Their motto “Cool Things for Cool People” drew me in immediately and we spent a few hours looking in every nook and cranny, talking with Gertie (that is a future blog post) and enjoying all that this place had to offer. 65 different vendors keep the inventory in this place changing and each booth offers more eclectic items that the discerning shopper can buy. From jewelry to up cycled clothing to vintage glasses which my friend Audrey would love – it is a cornucopia just waiting to be discovered. If you are ever in Asheville this has to be a stop on your itinerary. Located at 45 South Broad Avenue it is conveniently located next to Hopey and Company –a wonderful health food grocery that is worth taking a look at. 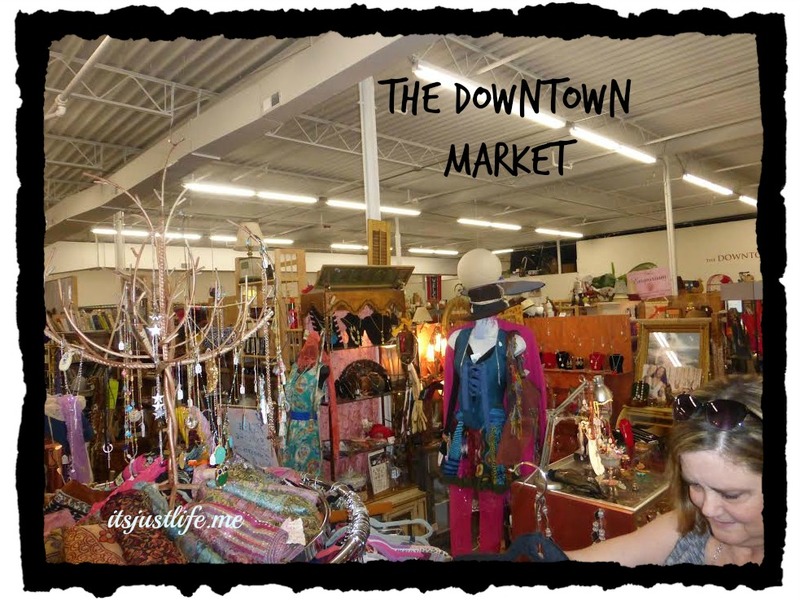 Don’t worry–I will be doing another post about The Downtown Market later to show you some of the great items they have available there but for now this is just a peek. Next → What Do Clear Lake, IA and Chicago Have In Common? Thanks! IT really is a wonderful find for my collection. Thanks, Ozzie. Glad to see the comment worked for you this time! What a find! That Downtown Market looks exciting..cnt wait to hear. It is so pretty! I love it! It really was quite a find and was only $12 I think. (I bought a couple of other things at the same time–imagine that!) . This market was so fun. I love the lacy look which makes it look very Victorian. I´m sure your guests will be very impressed when you serve tea in it. I think Earl Grey would be a good choice for this teapot. I was thinking the exact same tea, Darlene!! 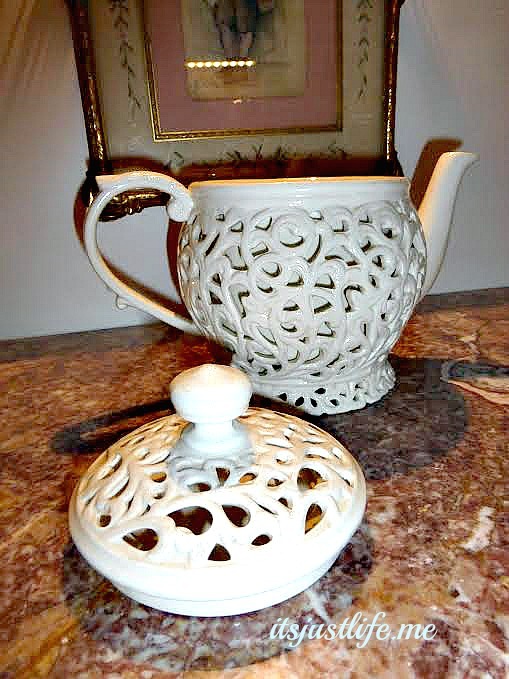 It would be a wonderful brew to serve out of this lacy treasure. I am glad you had such a good time and a were able to find another teapot.. I found quite a few but only bought one!!! I exercised some self control. Vintage glasses? Oh, yes, I would have loved shopping here with you and Ann. I know you had the best time together. So wonderful that you could spend five days with her. Friends are to be cherished. I still have blog posts to write from vacationing in Iowa, Illinois and Wisconsin last summer. Too much to write and not enough time always. I agree–too many posts to write. I have so many in the draft section of my blog just waiting to be fleshed out. It takes time to get them composed and I also have to be in the right frame of mind . Hope to get a few done this week . I like this teapot. Happy you two had a fun trip. I wish I could check out that health food market. LOVE this one! Might be one of my favorites yet! And the Downtown Market looks like an awesome place to explore!! The Downtown Market was fabulous! The bloggers would have been “loud” in there! Love the teapot. I think I have to move where you are so I can tag along with you and the fun you have! Come on –I am not sure if you can keep up with me right now, though. I am here, there, and everywhere the next 2 months! I love stores like that! It’s shameful how long I think I could spend wandering around in there. 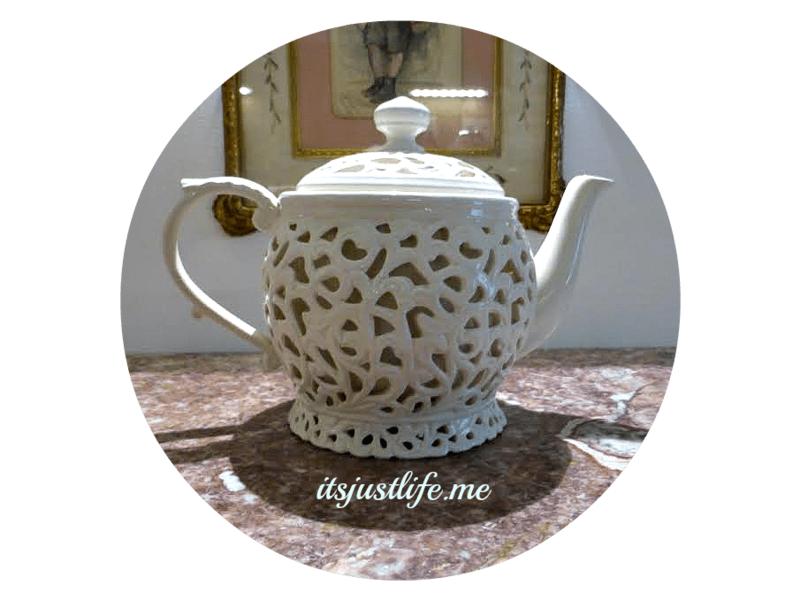 Love this pretty lacy teapot!! Oh my goodness—I could have spent so much time not to mention money in there! It was amazing! Thanks, Carl! I love it! Beth Ann…Love your blog! It is so thoughtful. I also love teapots and have been admiring the one you got at The Downtown Market for a while. I am so glad it went to a great home! Look forward to your next visit at our place! Thanks so much for stopping by, Susie! I love the teapot! Absolutely love it! Of course it was up to my friend to ship it to me since I was still traveling after I left Asheville. I will definitely be back–there are so many treasures there. I managed to get out of there with a top, a teapot, a repurposed book/journal, sleeve pins, cards and something else I am forgetting! I plan to do another post later on about the market itself so stay tuned. Thanks for sharing the post—would love to see more folks jump on board to support your business. When my daughter married a “Tar Heel” they lived in Gibsonville (which is very near Ashville). Hubby & I attended her chapel wedding & spent a couple days in the area. Gosh–I have to look up Gibsonville now! I don’t know where it is.